Give the Ultimate one-of-a-kind gift to the bride and groom. Send us the actual broken glass or bulb from the ceremony, and we'll have it suspended in a clear Lucite® mezuzah for you to give to the happy couple. Imagine -- that magical second when the glass is broken -- frozen in time -------- forever! 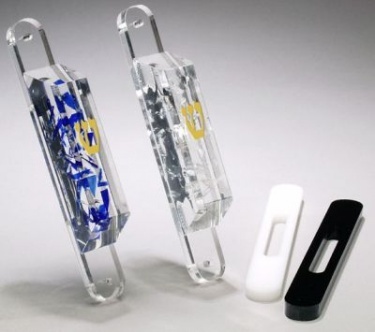 This clear Lucite mezuzah is guaranteed never to fade or yellow, ever! Wedding Mezuzah includes engraved and gold color-filled "Shin". Kosher inserted scroll available for an additional $40. Turn-around time is about 4 weeks from receipt of your broken glass. Each mezuzah is pain-stakingly hand-cast by skilled artisans who embed each shard of glass by hand. Thank you, Jewish Bride, for working with us. We got the best service and help with getting a Kosher scroll in our Wedding Mezuzah.